I hope you are having a wonderful week! Today my friend Jennifer has stopped by to visit and to remember some special dachshunds. 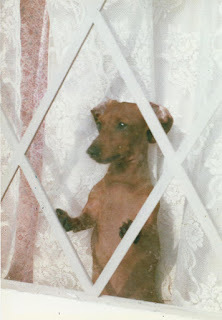 Jennifer is a friend of my Momma from a wonderful dachshund group, and she has some very special doxie memories. 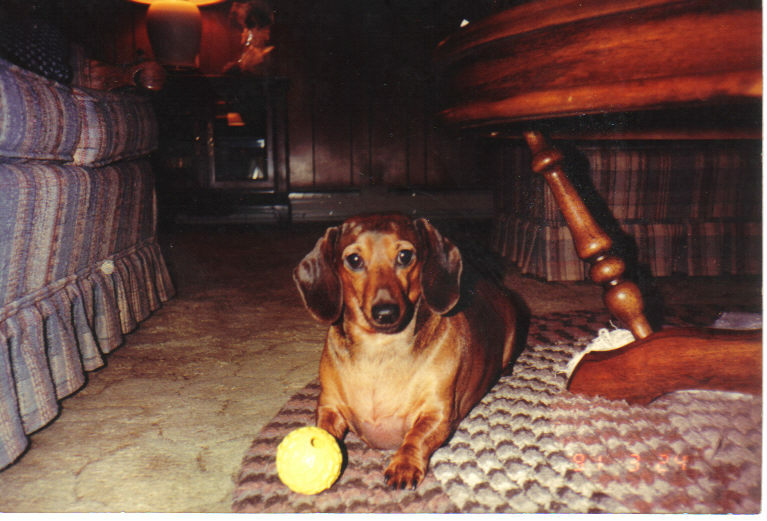 She visited before with her dachshund Stevie May Allen: click here to read Stevie's story. Jennifer: Hi, Abby! It's always wonderful to talk with you. Today, I'd like to remember four very special dachshunds, Bitsy, Punkin, Maxie and Talley. Bitsy was a fiesty, wonderful little girl, whose health problems took an early toll on her life. She was a diabetic and was absolutely inseparable with my mother. They truly were soulmates. I always wondered why Bitsy left us so early in her life, but just a year or so later, my mother unexpectedly and suddenly passed away. I believe Bitsy knew and chose to leave us early so that she would be there to greet my mother when that fatal day arrived. We got Bitsy and Punkin (who shared the same birthday) at the same time, and there always was an uneasy peace between the two. Punkin loved to devil Bitsy, who was a very prim and proper lady and who always perked up noticeably whenever French was being spoken on television. Mother always called Bitsy her "little mademoiselle." 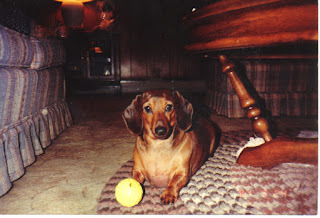 Punkin was a live wire whose favorite thing was to go to Sonic and have a root beer float. She would plunge her head into the cup and not come up until at least half of the treat was gone. Her face would be covered in foam, her eyes literally were almost crossed with culinary ecstasy and she would only pause a moment to take a breath before diving her head back in to gulp down the rest of the root beer float. 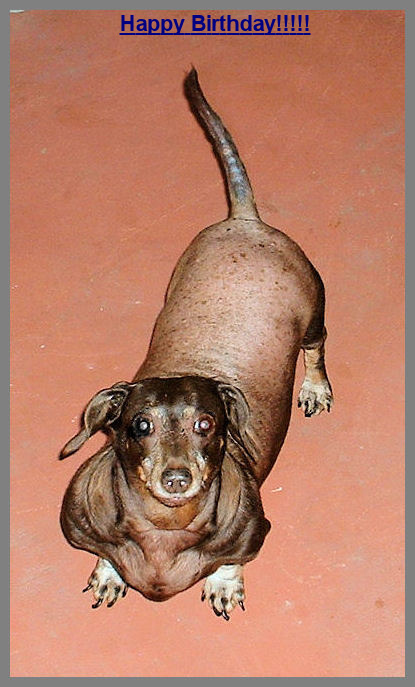 Maxie came to me as a rescue and had been terribly mistreated -- so mistreated that as her body was shutting down to die, she lost almost all her hair. In spite of treatment from medical professionals in Georgia and Ohio, she never fully recovered or regained her hair, but she was as healthy and happy as good veterinary care and I could make her. She was 7 when I adopted her, and I promised her I would give her at least as many good years as she had endured with her abuser. Thankfully, Miss Maxie lived almost 8 years and was able to know real love and care. She and Talley had an uneasy peace, but near the end of their lives, they came to at least appreciate each other. Talley was a very special girl, who was with me during some of the darkest times of my life. She truly was my lifeline, the only reason I got up each morning and was the rock of my existence. When Punkin passed away, Talley became an "only child" for a year or two, and she quickly became the supportive, patient, loving soul that I needed. I always told her that she really wasn't a dachshund, but was a psychotherapist. I will always be grateful to her for bringing me back to the daylight from a dark time. There were two other special dog friends in my early life. My father gave Miss Petey, a miniature pinscher, to me for my ninth birthday. A month to the day later, he passed away. Petey was always a reminder that his spirit would always be with me. She lived to be almost 19. Several years later, my mother and I adopted Pepper, our first dachshund. She was a wonderful girl and lived to be almost 11 years old. Abby: I enjoyed visiting with you today. Is there anything else about your doxies you would like to share? 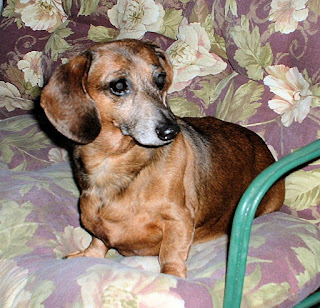 Jennifer: Today, I have Tookie, Miss Stevie and Trixie, all dachshunds, who are creating their own special memories with me. I am so very, very thankful for my canine friends as they are the only family I have (my mother was my last living human relative). Dogs truly are gifts from heaven. Abby: Jennifer, thank you for visiting and sharing Bitsy, Punkin, Maxie, and Talley's stories. I loved reading about them and seeing their beautiful pictures! I especially loved reading about Punkin drinking root beer floats! Those sound delicious. My Momma agrees with you that dogs are gifts from heaven. I like that sentiment as well. Friends, if you would like to leave a message for Jennifer, you can do so in the comments below. Please also let me know if you would like to visit to remember your special dogs or cats in a future blog post here. I believe that our pets are sent to us for a reason. They come to us at different stages and times in our lives. We are here to take care of them so that they can take care of us. And, they always do. 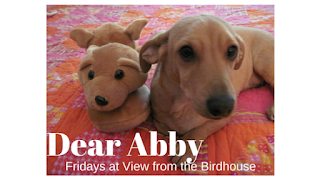 Abby, thank you for sharing this lovely tribute to some very special pets. Jennifer, I really enjoyed reading about all of your wonderful family--both here and in Heaven. We just can't replace the kind of love that our special pets give us! Thank you for sharing! Awe I do believe pets and people come into our lives for a reason <3 so special <3 thank you for sharing with us! Thank you for visiting! I agree SO MUCH about the special bond between pets and people. What special memories of your pets, Jennifer. Thank you so much for sharing! Awww this is so beautiful! I am not so much of a pet person myself but I can totally understand the strong emotions and sentiments for pets. Adore the bond between humans and pets. Thanks, friends! I appreciate your visits. Animals hold such special places in our heart! Love reading about these memories. Thank you for sharing.